Ever wonder what powers Google's world spirit sensing Zeitgeist service? No, it's not a homunculus of Georg Wilhelm Friedrich Hegel sitting in each browser. It's actually a stream processing (think streaming MapReduce on steroids) system called MillWheel, described in this very well written paper: MillWheel: Fault-Tolerant Stream Processing at Internet Scale. MillWheel isn't just used for Zeitgeist at Google, it's also used for streaming joins for a variety of Ads customers, generalized anomaly-detection service, and network switch and cluster health monitoring. MillWheel is a framework for building low-latency data-processing applications that is widely used at Google. Users specify a directed computation graph and application code for individual nodes, and the system manages persistent state and the continuous ﬂow of records, all within the envelope of the framework’s fault-tolerance guarantees. This paper describes MillWheel’s programming model as well as its implementation. The case study of a continuous anomaly detector in use at Google serves to motivate how many of MillWheel’s features are used. MillWheel’s programming model provides a notion of logical time, making it simple to write time-based aggregations. 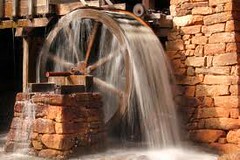 MillWheel was designed from the outset with fault tolerance and scalability in mind. In practice, we ﬁnd that MillWheel’s unique combination of scalability, fault tolerance, and a versatile programming model lends itself to a wide variety of problems at Google. Apache: What is Samza? : a distributed stream processing framework. It uses Apache Kafka for messaging, and Apache Hadoop YARN to provide fault tolerance, processor isolation, security, and resource management. Storm: a free and open source distributed realtime computation system. Storm makes it easy to reliably process unbounded streams of data, doing for realtime processing what Hadoop did for batch processing. Any details on a release?